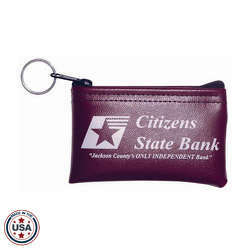 Shown with optional 1" Key Ring. Key Ring does not ship attached. For Key Ring add $0.15(v) each. Second side same copy, $0.10(v) each. Second side different copy, $0.20(v) each. Additional Imprint Colors: Add $0.15(v) each, maximum 3 imprint colors. 150 piece minimum for multi-color orders. Ink Changes: Ink changes within a purchase order run $15.00(v). 150 piece minimum for ink changes. PMS Color Matching: Not available at this time. Imprint Area: 1 3/4" H x 3 3/4" W.
Case Pack: 150 pieces, 13x10x8, 10 lbs. ..............300 pieces, 22x16x13, 20 lbs. Peak Season (June-September) can reach 11-13 business days.